Background: Low temperature is a serious environmental factor that affects plant growth and cultivation. As one of the most popular fruit crop in the world, grapevine exhibited much difference in cold stress tolerance of different cultivars. Objective: To understand the cold tolerance mechanism in grapevine and provide certain proteomics data may contribute to its breeding for enhancement of cold tolerance. Method: In this study, iTRAQ-based comparative proteomic analysis was conducted to identify cold-response proteins in two grape cultivars including a cold-resistant grape cultivar (Vitis amurensis) and a cold-sensitive grape cultivar (Vitis vinifera cv. Muscat of Hamburg). Results: Totally, 532 and 264 proteins were differentially expressed in Va and M, respectively, with 91 overlapping proteins. Compared to the control, most of these proteins exhibited down-regulated at 12 h, then up-regulated at 24 h, and decreased again at 48 h under cold treatment. 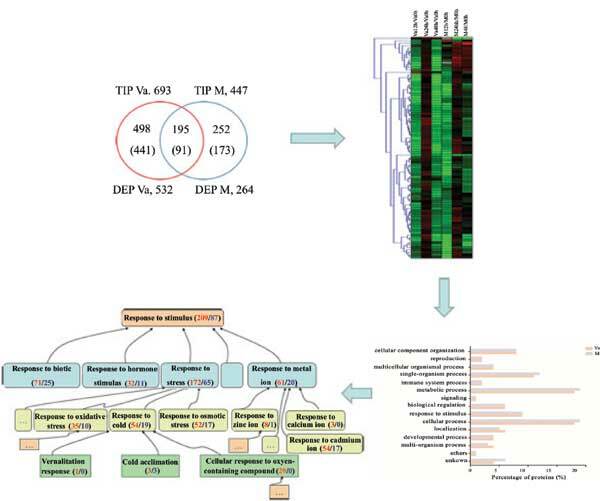 Among these differentially expressed proteins, those involved in metabolic process, cellular process, single-organism process and response to stimuli were the most abundant group. Conclusion: Based on these findings, we proposed that proteins involved in photosynthesis, starch and sucrose metabolism, response to stimuli (such as glycine-rich RNA-binding protein, calmodulin, WSI18 protein etc. ), signal transduction may play important roles for grape to resist cold stress. These results provide new insight to understand the cold tolerance mechanism in grapevine and may contribute to its breeding for enhancement of cold tolerance. Keywords: Cold-response proteins, cold stress, grape, iTRAQ, proteomic. Keywords:Cold-response proteins, cold stress, grape, iTRAQ, proteomic. Abstract:Background: Low temperature is a serious environmental factor that affects plant growth and cultivation. As one of the most popular fruit crop in the world, grapevine exhibited much difference in cold stress tolerance of different cultivars.